Fishing kayaks help catch the fish that others can’t reach, period. Before you get out your wallet to buy a fishing kayak, however, there are some important considerations to make. Do you want a sit-on-top model? A hard chine or round chine? Maybe you want your kayak to have peddling capability! These are just a few considerations to make when searching for the best fishing kayak. From motorized to the inflatable; ocean-ready to hobbyist and fishing ready to ‘fishing capable’—we’re here to break it all down. This article will serve as a guide so you can feel confident in choosing the best fishing kayak for your needs and budget. Below you’ll find fishing kayak reviews to help you break down what you need in a fishing kayak, and make an informed decision when buying. Fishing kayaks are very affordable, but unfortunately not easy to find in local stores. Giant retailers chain retailers often carry a few, but even they only offer a few select models from a few select brands—informing you they can order you one from their online inventory. This fishing kayak guide and review will help you get the information you need to feel confident enough to order the kayak that best suits your needs, and not pay more than you need to. The way you intend to use your fishing kayak should dictate the attributes you look for. Carefully-consider how you plan to use your fishing kayak before you commit to a purchase and you’ll be grateful for years to come! These features are focal points of many of the best fishing kayaks on the market and typically become more available based on price range. For example, the more expensive models often have mounting rails for trolling motors and smaller boat motors. While these fishing kayaks are amazing, you may be able to save some money if you find using paddles/oars to maneuver. Another important feature to pay attention to the size of kayaks—particularly their width. In many kayaks used simply for lolly-gagging around on lakes and in the ocean, smaller sizes are well suited and often preferred. A fishing kayak should be designed to support quick maneuvering well, and assume that operators will be actively engaged in supporting those movements. For a fisherman, however, a larger kayak is often preferred because it provides a greater stability while performing certain fishing tasks, such as baiting, casting, and reeling in the big one! The smaller, narrower, shorter kayaks not made for fishing specifically can often tip over easy when fishing—getting you wet, losing your gear, and scaring away the fish! For the purpose of this guide, kayaks will only be divided into two different categories—inflatable kayaks and hard-body kayaks. Hard-body kayaks have the advantage of resisting tearing, puncture by fishing hooks and knives, and are typically much better at maneuverability. Hard-shell kayaks are more difficult to transport, much tougher to repair, and are more susceptible to large impact damage such as hammering against rocks. Inflatable kayaks are popular for their ease of transport, larger sizes, easier repair, and ability to handle large impacts with less chance of damage. Inflatable kayaks are more likely to get sun damage, more likely to become punctured by knives and fishing lures, and are slower and more difficult to navigate in straight lines. For the beginner fisherman, or for those on a tight budget, it’s often recommended that you purchase a hard body kayak. Hard-body kayaks may seem slightly more difficult to transport but inflatable fishing kayaks often require expensive materials to ensure they are durable enough for fisherman. Inflatable fishing kayaks are often 2 to 3 times more expensive than hard body kayaks. There are certainly inflatable fishing kayaks that are being sold for the same price as the hard-body kayaks, but they are often plagued by bad reviews on Amazon, lack of features, and are known to have many issues. It’s important to know your budget, but even more important to know what you need from your kayak while fishing! Kayaks have several different design aspects that can play an important role in your decision on the best kayak to buy. These features differ depending on what type of waters you’ll be in, what type of movements you think you’ll be doing, how much equipment you’ll be carrying, and how comfortable you want to be. We’ll start by listing some of the more important design aspects of fishing kayaks, as well as how they affect the craft. This is the measure of the inner area of the kayak which is largely related to the amount of water it displaces as well. High volume kayaks are notably more rounded in design and are fairly typical for fishing kayaks. These kayaks often feature large amounts of interior storage, larger degrees of stability, and generally wider beams. Nearly all inflatable kayaks fall into the high volume category, with most of the low-volume kayaks either made for non-fishing use or just extra small. As for fishing kayaks, these designs usually fall into the lower-volume category—although still having ample storage. Fishing kayaks often utilize access to interior recesses as a means of providing rod storage, live wells, or just general storage. The utilization of these spaces makes fishing kayaks with lower volumes end up providing more storage than non-fishing, high-volume kayaks. The hull is regarded as the bottom of the boat, the part making most direct contact with the water, and can be separated as either being displacement types or planing types. Displacement hulls are best for speed, as the cut through the water like knives. These hulls are narrower and are typically designed with bottoms that come to a point. Planing hulls are flat-bottom designs, often wider overall, and are best suited for turning and stability. These types of hulls are a bit sluggish for acceleration, and sort of ‘skim’ across the water once they have picked up speed. Overall, planing hulls are best suited for fishing kayaks as they offer an overall better platform for any fisherman to perform vital tasks without the worry of overturning. The chine of a boat is the type of shape as seen from looking at them head-on, particularly at the point on the side where the design begins to curve upward. A ‘hard’ chine, is where the design takes a sharp angle upward, as seen on many flat-bottom, planing-type kayaks. Hard chines are great for allowing a boat to continue planing while turning or spinning but are also more susceptible to catching and turning the boat over. A soft chine is considered to be a more forgiving design and is associated with many displacement hull type designs. Many kayakers seek to find a balance between the two—pairing speed with maneuverability—and avoid any extremes. Overall, kayak designs with a harder chine are considered to be better options for fishing kayaks as they help provide better spinning and turning. If you were to look at a kayak directly from the side, the curve of the bottom of the boat, as it stretches from bow to stern, would be the rocker. Kick rockers are designs that are relatively flat and are almost always seen on planning hull designs and larger volume kayaks. A continuous rocker is a design that curves along the entire length of the kayak. These types of designs are most often seen in non-fishing kayaks and are better suited for avoiding becoming stuck on rocks or another large object. Just about any decent kayak design is going to have some accommodation for your footing, many with highly specialized formed areas. Footpegs are features that some kayaks offer that allows a higher degree of adjustment for different body types. While these features are more sought after by non-fisherman, it’s something to pay attention to. For most of the modern fishing kayaks, a bulkhead is used in place of foot pegs, which provides a stable resting point for your entire foot, as opposed to the peg type supports. Proper footing in your kayak and help keep you, and your kayak, in a more stable state throughout your entire adventure. Overturning one’s kayak is never fun! For most fisherman, stability over speed is a sacrifice they’re willing to make. Considering much of the time spent in a fishing kayak is spend fishing rather than racing around, stability is often one of the most important features to consider. Wider beams, planing hulls, larger volumes, hard chines, and kick rockers are all variations of a kayak design that help promote a greater overall stability. Stability, however, can be broken down into two variations—primary stability and secondary stability. Primary stability is the degree to which a boat is stable when resting right-side up on the water. Secondary stability is directly related to the side of a kayaks sides and comes into play when you may be leaning, or getting ready to tip over. More rounded, higher-volume kayaks tend to have a greater secondary stability rating and are generally recommended as good choices for fishing kayaks. The fishing kayak brands are also the best makers of any kayaks. Many of the best fishing kayaks are simply designs from these brands that specifically cater to the needs of fishing. Fishing kayaks are just kayaks where manufacturers have made special accommodation for the needs of fisherman. That said, some really good kayak brands aren’t well-versed in what fisherman actually need. The brands listed below all make incredible kayaks but also have an astute awareness of the features and durability needed by a fisherman. Some brands, such as Native Watercraft, make fishing kayaks used by professional anglers around the world! 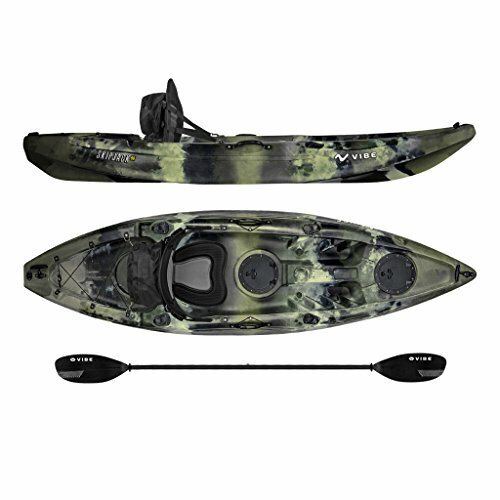 Ocean Kayak Fishing Kayaks feature a balanced blend of features to provide speed, maneuverability, stability, and help accommodate the needs of fisherman everywhere. This craft comes mostly in an open deck style, with a center console between the legs, medium widths, and are typically longer than most fishing kayaks. The Prowler Big Game II Angler, for example, comes in at roughly 13 feet in length, and 34 inches in width while still boasting a 650 lb capacity! This fishing kayak is well-suited for those looking to bring lots of gear, such as during camping trips. Other models such as the Tetra, Malibu, and Caper have helped make this brand very popular among fisherman and, as their name does imply—quite popular with salt water fisherman as well! These fishing kayaks are slightly less expensive, but also do not come with any built-in propulsion systems or foot-powered systems. Ocean Kayak products are available through some local deals and most outdoors gear online retailers. eMotion fishing kayaks are very straight-forward designs that incorporate much of their specialized functions right in the molded design. This is another company that offers other kayaks and watercraft not just for fisherman, but also makes an admirable accommodation for those anglers looking to reach those hard-to-reach areas. Models such as the Guster Angler, Renegade XT, and Stealth Angler have ample storage area with access points and fastening straps located throughout. While these kayaks don’t have all the flash such as plate-mounted rod holders or foot propeller systems, many fishermen looking to try our a fishing kayak for their first time find eMotion products to be very well-received. eMotion Kayaks are available at certain local dealers and online. Wilderness Systems is a company that is serious about adventure technology. They make many kayaks that are built solely for the purpose of going over waterfalls, banging into rocks, and also keeping your gear (and you!) protected. It is no surprise that their fishing kayaks are some of the most sought-after on the market. Models like the Pungo 120 Angler offer narrow-formed, inside seating, prowess on the water—while other models such as the Tarpon 130x sit-on-top fishing kayak offers extreme storage and ergonomic design. These kayaks are certainly among some of the most elite, non-propeller kayaks on the market, and are surprisingly affordable. Wilderness Systems fishing kayaks are available through certain local dealers, and also a select handful of online retailers. Advanced Elements is known primarily for their well-reviewed, extensive line of inflatable kayaks. Models such as the AE1001-R have extensive numbers of positive reviews online, sell for a medium-range price, and offer many great features on top of the portability of being inflatable. While many kayaks such as the AE10001-R are being used by enthusiasts all around the world, the Straight Edge Angler is the inflatable fishing kayak option of choice from Advanced Elements. Featuring aluminum reinforced framing, an aluminum accessory mounting rail, integrated pressure release valve, and steel rings to anchor and stringer attachment—the Straight Edge stands out among inflatable fishing kayaks. Advanced Elements products are available through select online retailers. Lifetime Fishing Kayaks are great products that focus on affordability, without sacrificing too many features. Lifetime is another company specializing in many different types of watercraft—including paddle boards. In addition to their very popular pleasure crafts, Lifetime offers a decent selection of fishing kayaks as well, focusing on the needs of the angler. The Tamarack, in particular, is a well-designed fishing kayak featuring great use of storage straps and interior storage areas. Lifetime kayaks don’t feature an exhaustive array of accessories or bolt-on features, but their carefully-designed hulls and ergonomic interiors produce a unique intersection of form and function. These kayaks are very stable, provide ample storage room, and are great for maneuvering around on the water. In addition to kayaks, lifetime is one of the few brands on this list that also have an extensive product line in other markets, ranging from picnic tables to outdoor sheds! This, however, doesn’t seem to have taken any focus away from their watersports team, and Lifetime fishing kayaks are great products suited for anglers that know what they’re looking for. Lifetime fishing kayaks are available online through select retailers. Taking into account all the various features offered among the many great fishing Kayaks by some of these popular and trusted brands, we can now start to understand which among them are the best. While no single fishing kayak will be the best for every single scenario, those buyers able to spend more are likely to be drawn to a select few among the pack. One of the common features offered among the more feature-rich kayaks is the foot-powered propulsion systems from brands such as Hobie and Native Watercraft. These elite angler crafts offer versatility and, in the case of the Hobie Pro Angler, even accommodation for foot propeller use in water only inches deep! These kayaks come with optional live wells, accessory rails, battery-powered systems, and nearly everything else one might imagine. The best fishing kayaks are, as you may have guessed, usually the most expensive kayaks. Extra features such as foot pedal systems and livewells don’t come cheaply. Tandem models are going to be more expensive than single-person kayaks, and those models that offer extensive inclusion of 3rd party outfitting like the Plano rod holder solutions offered by Wilderness Adventures are also going to show a jump in price. Many of these accessories are features that many fishermen end up purchasing in down the road after buying their kayak. If you plan ahead carefully, however, you’ll find that buying models with accessories you’ll end up getting anyway will be cheaper than buying the accessories separately later. All models considered foot propeller systems and steering rudders seem to be the only gigantic difference between the offered features among most fishing kayaks. This is certainly not to say that all other angler kayaks are the same, just that everyone should know those features represent a whole other level of feature consideration. With these thoughts in mind, below you’ll find a list of the best fishing kayaks on the market today, their features, and where you can buy them.